Children, hundreds of them, sleeping on plastic boards lined up on the floor. Frightened mothers, clutching hungry children, dumped at a Phoenix bus station. Homeland Security, forced to shift gears from jails to child-care, requisitioning mattresses and porta-potties in an attempt to turn warehouses into shelters. Children are the big immigration story of 2014. Most of the tens of thousands of unaccompanied children crossing the border this year come from Central America. They are fleeing violence, gangs and extreme poverty, mostly coming from Honduras, Guatemala and El Salvador. Vox reports that “the number of children crossing into the country from Central America has exploded — rising fivefold since 2011.” The New York Times cites an internal Homeland Security document projecting more than 90,000 unaccompanied minors entering the United States in fiscal year 2014. U.S. immigration detention facilities have been stretched far beyond capacity. Homeland Security has called for help from FEMA to find more detention spaces to house unaccompanied children and mothers with young children. 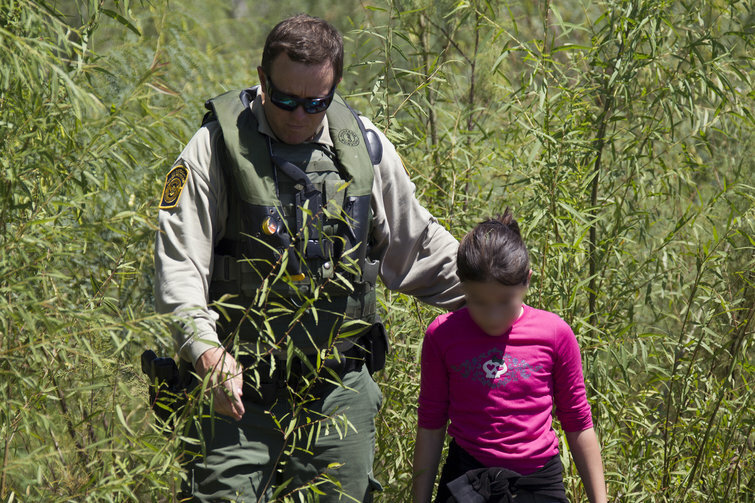 While most of the unaccompanied children, and mothers with young children, cross the border in Texas, the Border Patrol doesn’t have enough places to put them in Texas. Hundreds are being flown to Tucson and then bused to other places within Arizona — such as the shelter set up in a Nogales warehouse, housing at least 750 children. Nogales residents, responding to their plight, are collecting clothes for the children. While many are between 15 and 17 years of age, Nogales Mayor Arturo Garino said some are as young as one year old. Vox analyzes the “push” factors of violence and poverty driving children out of their home countries and the “pull” factors of hope, relatives and possible changes in immigration laws encouraging them to come here. Researchers conclude that the “push” of gang violence is the most significant factor in the current surge of child migration. A UNHCR report includes the story of Alfonso from El Salvador. If the “parents or guardians” do not have legal residence in the United States, then what? Well — that’s just one more Catch 22 in the screwed-up U.S. immigration law. If you are a parent in Honduras, and there’s absolutely no job available, and your children are starving — there is no way for you to legally emigrate to the United States. If you are a twelve-year-old in El Salvador, and your older brother has been killed by a gang that works with drug traffickers and now they are coming for you — there is no way for you to legally emigrate to the United States. If you are a Guatemalan mother who has been working in the United States, without papers, for 10 years, paying taxes here and sending money home to support your children — there is no way for you to get legal status in the United States. And if your children flee violence and poverty at home, braving the often-deadly perils of the journey north, and arrive on your doorstep — there is still no way for you, or your children, to to get legal status in the United States. The long-term challenge is changing conditions that drive children and families out of their homes and their own countries. That requires international effort and cooperation. What we could do — right here and now — is to make changes in U.S. immigration laws to help the children who are here, and their families. That, of course, is what Congress — or more accurately, the anti-immigrant Republicans in Congress — still refuse to do.